Welcome Welcome to the Pinnacle Presbyterian Church Art Walk. The PPC campus is home to creative works of art, commemorations of musical performances and architectural elements designed to honor God. It is a site of great beauty, holy significance and wonderful surprises, all of which make it a very special place. 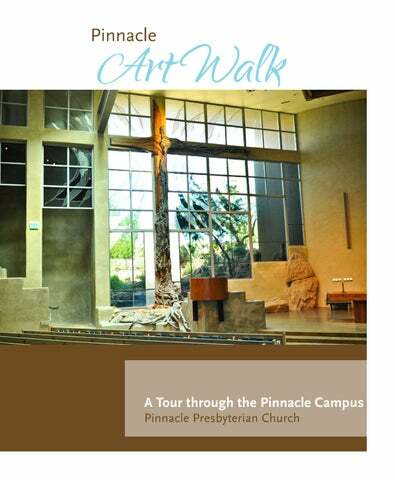 This brochure is designed to assist you on a self-guided tour of the highlights of Pinnacle Presbyterian Church. A map of the campus can be found on page 29, and an electronic version of this brochure is available on the church website at www.pinnaclepres.org. The campus of Pinnacle Presbyterian Church is a lovely 20-acre parcel situated in the northern reaches of the Sonoran Desert with the foothills of the McDowell Mountains just to the east. The church is named for the rocky 3,169-foot summit called Pinnacle Peak; a Scottsdale icon located just a mile or so northeast of the campus. Groundbreaking for the 150-seat Chapel, situated on five acres of land that was provided by the Presbytery of the Grand Canyon, took place on Palm Sunday 1993. Over the years Pinnacle Presbyterian continued to grow in membership, and surrounding land was purchased to accommodate that growth. Groundbreaking for the 800-seat Sanctuary took place in 1999. The Sanctuary had the honor of being Scottsdale’s first “green” building under the newly-adopted Green Building Program. Every building on Pinnacle’s campus was thoughtfully designed by local architect Jim Roberts of Roberts/Jones Associates, Inc. and built by Redden Construction. Mr. Roberts, who grew up on the Navajo Reservation, was careful to design and incorporate spiritual significance into various areas of the campus facilities. “Streams in the desert” was the theme chosen to be carried throughout the Pinnacle campus. Streams wrap around the Chapel through the faceted stained glass windows. “Beside still waters” is the anchor in the Memorial Garden. In the Sanctuary the words from Revelation 22:17 provide a deeper understanding as the Spirit entreats us to “Come!...Let everyone who is thirsty come; let anyone who wishes accept the water of life as a gift.” Just as water forms an oasis in the sand, water provides the oasis for our church community. 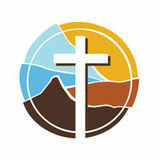 Pinnacle Presbyterian Church is the sanctuary in the desert where people can come to grow their faith in God. Sanctuary WORSHIP SPACE: Designed to seat 800 people, the Pinnacle Sanctuary is full of spiritual significance. The worship space is carved into the desert floor, creating a canyon with flagstone flooring and earthen colored walls. The theme “streams in the desert” that was begun in the chapel is continued here. The stained glass on the upper north wall represents a river, as does the main aisle which flows downhill from the narthex to the chancel with tributaries branching to the right and to the left toward the baptismal font. According to architect Jim Roberts, “...the focal plane (of the sanctuary) has three distinct points or facets. The left-hand focal point is the emergence to light of the ‘Sanctuary Canyon’ with focus to nature and distant mountains bringing with it the life-giving spiritual metaphor of the water in a desert. The central focus, an austere, curved wall mass, symbolizes the ‘Rock’ as a stable, reflective and meditative form. Finally, at the righthand focus, the organ speaks from behind the choir bringing joy and celebration to the congregation.” As visitors enter the worship space they are greeted with words from Isaiah 35:6-7 on the glass doors in English, Spanish and Creole to recognize our southwest heritage as well as our relationship with Pinnacle’s sister church in Haiti. Adorning the east and west walls of the balcony are twelve sconces representing the twelve apostles. On the ceiling are three unique fixtures, each hung from a skylight. This only source of natural light from above represents the Trinity. Behind the cross is a multi-textured window depicting the Holy Spirit, and the cross itself, sometimes referred to in the New Testament as the tree of life, is rooted in both the baptismal fountain, the Water of Life, and the pulpit, the Word of Life. staples. The three peasant girls holding the “life cycle” of wheat was oft-painted by Soviet artists and became a symbol of the achievements of developing socialism. Wheat and bread, of course, are also Christian symbols. The artist, Nikolai Petrovich Garbar, was born in 1930 in Ivano-Frankovsk, Western Ukraine. In 1953 he graduated from the Kiev Art Institute, and a year later he exhibited two paintings, Old Country Woman and May in the Moscow Art Exhibition where he caught the attention of both the critics and the public. At the conclusion of the Exhibit, both paintings were purchased by the Leningrad Art Museum, and Garbar’s career was launched. Rehearsal Hall Adorning the wall leading to the rehearsal hall, found near the south sanctuary entrance, hangs a photograph of the inside dome of Salzburg Cathedral. The 17th century Baroque style Roman Catholic cathedral in Salzburg, Austria, is where Wolfgang Amadeus Mozart worked as court organist and composer. It was here where Mozart first performed Coronation Mass, most likely on Easter Sunday, April 4, 1779. Two hundred and twenty-four years later, almost to the day, Pinnacle Chancel Choir presented the same performance with orchestra on April 6, 2003. Inside the rehearsal hall, on the lowest level, is a print of the famous GermanEnglish composer, George Frideric Handel (1685-1759). In June 1743, the British army and its allies, under the command of King George II and Lord Stair, won the Battle of Dettingen against the French. Handel, who was “Composer of the Musick to the Chapel Royal,” was commissioned to write the music for the appointed day of public thanksgiving in honor of the victory. The composition was performed for the first time in 1743 in the Chapel Royal of St. James’s Palace in London in the presence of the King. Pinnacle Chancel Choir with orchestra performed that famous composition, Dettingen Te Deum, in the sanctuary on March 21, 2004. Beside the portrait of G. F. Handel hangs a print of Franz Joseph Haydn (17321809). Haydn was an Austrian composer of the Classical period. Catholic and deeply religious, he typically wrote “in the name of the Lord” at the beginning of each composition and ended the completed score with “praise be to God.” Haydn composed fourteen masses over the course of the years. Six of his most spectacular masses were written later in his life when he worked as a court musician for the wealthy Esterhazy family. The world was in turmoil at the end of the 1700’s, and Austria mobilized into war in 1796, the same year that Haydn composed Mass in Time of War. In 1798, Napoleon had won four major battles with Austria in less than a year. During the summer of 1798 Haydn finished the composition he named Missa in Angustiis (Mass for troubled times), and later learned that on August 1 Napoleon had been defeated in the Battle of the Nile by British forces led by Admiral Horatio Nelson. Because of this coincidence, the composition gradually acquired the nickname Lord Nelson Mass. Pinnacle Chancel Choir blessed the community with performances of Mass in Time of War on April 12, 2006, and Lord Nelson Mass on March 25, 2007, both with orchestra. Pinnacle Preschool TALLULAH PROJECT: As visitors enter the preschool campus they are sure to notice the stunning tile mural that adorns the wall of the nearest classroom. The focal point of this beautiful scene is the tree of life inspired by the cross/tree of life in the sanctuary. The multi-textural mosaic mural, called the Tallulah Project, continues around the corner and up the sidewalk to embellish the walkways of the preschool. The project was launched with grants won in 2005 and 2006 from the Arizona Commission on the Arts. The mosaics create a passageway depicting the landscapes of Arizona and how they are transformed by water, keeping with the “streams in the desert” theme that runs throughout the Pinnacle campus. The word “Tallulah” is a Native American word for running water. All of the clay tiles have been handmade by children and adults of the PPC community. These tiles are made in the classrooms, the art studio and at Saturday family clay workshops. Children and adults alike are drawn to the tactile sensation of working with clay. Developmental learning takes place as children work with this organic material. They learn social and language fluency, critical thinking skills, fine motor skills and problem solving techniques. Capitalizing on the malleability and forgiveness of clay, the Tallulah Project has provided an opportunity for the preschool community and the church community to create something beautiful together. WINDOWS: Ken Tony of Scottsdale Stained Glass is the artist behind the colorful leaded glass windows in the chapel. The windows were designed to complement the serenity of the desert flora as well as maintain the â&#x20AC;&#x153;streams in the desertâ&#x20AC;? theme which is carried throughout the Pinnacle Church campus. The motif of the windows was based upon six scriptures. The quarter circle window over the chancel shows the tree of life with a stream flowing beneath it. The large south window begins on the right with darkness and grows lighter as it flows to the left, culminating in the bright panes on the east end which represent the birth of Christ. Chapel Parlor The chapel parlor is a cozy and inviting space, like a comfortable and familiar living room. Against the wall is an attractive cabinet which anchors a contemporary abstract painting and is adorned with a beautifully unique glass vase. This arrangement was donated by Pinnacle member Liz Dalton. Although the title is unknown, the unique fine art painting was created by James Turco, a contemporary artist. Mr. Turco was born in 1960, raised in Denver, CO, and graduated from Western State College with a degree in Design. His artistic talent, expressed on both canvas and paper, often includes other materials, such as textured paper and metals. Mr. Turcoâ&#x20AC;&#x2122;s distinctive form of art has a universal appeal and has been shown in various exhibits around the country, as well as Hong Kong. The contemporary vase, 20 inches tall, is signed by artist Chip Scarborough and was hand blown in Czech Republic. A centuries old skill is involved in the manipulation of liquid glass. The historical craft of Czech glassblowing has a long history and tradition, but todayâ&#x20AC;&#x2122;s glass masters, such as Mr. Scarborough, can creatively fuse together different designs with the finest techniques to create wonderful works of contemporary art glass. Entrance/Exit E. Happy Valley Rd.